A dhurrie (also durrie or durry) is a thick flat weave rug traditionally used as a floor covering in Indian homes. And they can be pretty large – in India you can find them up to 20ft x 20ft – though in our Hove shop we have them up to size 9ft x 5ft (274cm x 152cm). Traditionally dhurries are made from jute, cotton or wool, and woven by hand by skilled weavers on a traditional horizontal or vertical loom, ensuring a truly hand-crafted all-natural product. The term dhurrie actually means the technique of weaving without knots, instead, the warp strands (lengthwise threads) are used as the base, and the weft strands (cross-wise threads) create the patterns, by passing or weaving through the warp. Dhurries can be coarsely or finely woven and because they’re not made using knots, they are reversible, and as they have no pile to flatten down, they always look fresh and new. This way of making Indian rugs and floor coverings dates back hundreds of years. Carpets and dhurries were first manufactured in Rajasthan when weavers from Afghanistan were invited to the royal Mughal ateliers in the 17th century. Since then, the craft has flourished and these simple rugs have now become one of the state’s most famous weaving traditions. The dhurries are usually made by weavers in villages who use looms to create an interesting blend of patterns – mostly geometric, sometimes floral, in a dazzling combination of colours. Our Dhurrie Rugs are hand-loomed by artisans in a village near Jaipur in Rajasthan, using traditional methods that have been passed down from generation to generation – occasionally including one method where they use their feet to weave – well they are for walking on after all! A particular feature of Dhurrries is that they’re low maintenance – they do not get infected by Silverfish or other insects that can damage carpets. 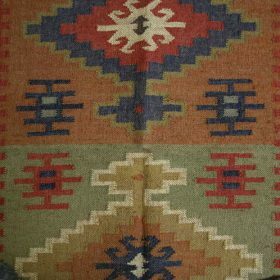 Also, unlike kilims that may have small gaps where different blocks of colour meet, dhurries have an unbroken weave so there are no gaps when different colours meet. Dhurrie designs are inspired by antique and traditional motifs. Stripes, geometrics, and rudimentary Islamic images, such as mosques and minarets, were traditional motifs, largely because they’re easy to create on the simple horizontal looms used to weave them. As Britain’s influence grew in 19th-century India, so did the popularity of European designs, including Victorian floral patterns. These days Dhurrie colours are warm, natural tones, with big patterns – different from modern, mass-produced rugs you might have seen elsewhere. Amazingly durable for their price, these flat weave rugs have seen a recent surge in popularity. Have a look at our range of dhurries and rugs here. This entry was posted in Blog and tagged Rugs.